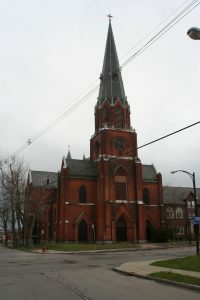 As the population of east Buffalo exploded in the last decade of the nineteenth century, a fourth Roman Catholic Church for the Polish people became necessary. Located just off prestigious Fillmore Avenue, Transfiguration parish would become one of the more affluent parishes in the city of Buffalo. 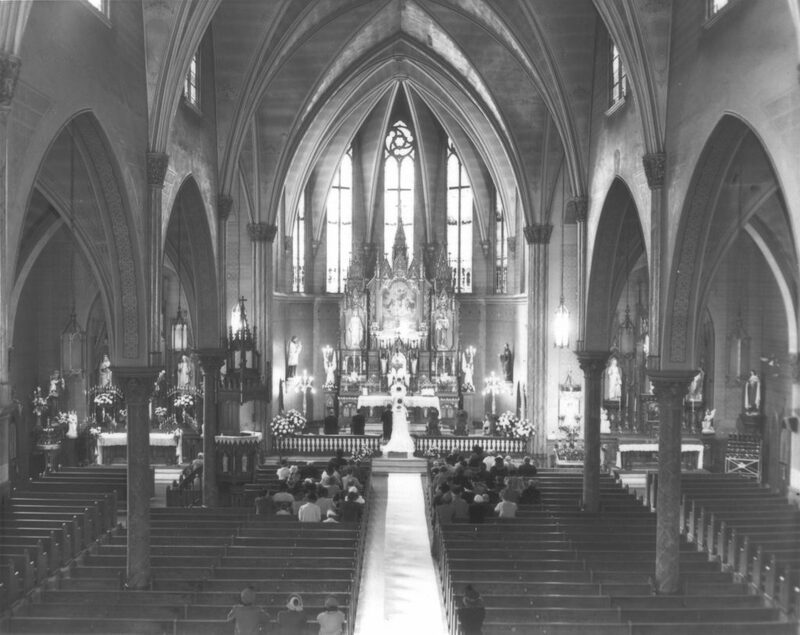 Transfiguration parish was established July 23, 1893 thanks to the work of the St. Joseph’s Society of Saint Adalbert’s Basilica and Father Wojcik of Assumption Parish. Together they asked permission of Buffalo’s bishop to establish a parish for the Poles living along Fillmore and down Sycamore. Since the area was expanding, the bishop quickly granted permission. A suitable plot of land was purchased on Stanislaus Street and a church and school building were soon raised. In less than a year over 150 families enrolled in the parish and three Felician Sisters from Detroit, Michigan were brought in to teach. By 1896, the small frame church was overloaded and a larger, more substantial church was needed. Well-known Buffalo Architect Carl Schmill was hired and a Gothic Revival church built of red brick church with a 180-foot steeple and seating for 1,400 was planned. The completed $70,000 church was blessed July 5, 1897. With this larger structure the parish had room to grow. As the area just off Fillmore became more affluent, many prominent members of Buffalo’s Polonia began attending Transfiguration. Some of the better known parishioners included Health Commissioner Francis E. Fronczak and architect Wladyslaw H. Zawadzki. In 1914, Zawadzki was engaged to design a modern school for the parish campus. He came up with a three-story, 14-class room, light brick building with an assembly hall, cafeteria, library, and separate entrances for the boys and girls. The first major milestone of the parish was its Silver Jubilee. Celebrated in 1918, no large celebration was held due to the influenza pandemic running rampant through the city. A Golden Jubilee, would be held 25 years later, but was a somberly celebrated due to the ongoing conflict in Europe. After the war, returning vets turned away from the East Side and began settling in suburban Western New York. Despite this early exodus, Transfiguration still thrived. In 1976, the church hosted Bishop Mikolaj Sasinowski from the Diocese of Lomza in Poland. The bishop was in America as part of future Pope and Saint, Karol Cardinal Wojtyla’s tour of the states. After the 1960s, suburban flight began to spread though the East Side. In 1985, Transfiguration School was consolidated with other Catholic schools in the East Side and the building was closed. In 1990, the church was threatened with closure until it was joined with SS. Peter and Paul on Clinton Street with the two churches sharing a pastor, Father Bagienski. A year later, the parish council determined the church building was unfit for use, due to structural issues and, services were moved to the old school building. On August 22, 1993, a dual celebration was held at Villa Maria’s Motherhouse Chapel in Cheektowaga: the congregation’s One Hundredth Jubilee and the closing Mass of the parish. The final Mass was celebrated by Bishop Head and 10 other priests with a mixture of Polish and English. At the conclusion of the Mass the hymn “Glory and Praise to our God” was sung and with its last notes the Parish of the Transfiguration was officially suppressed. Diamond Jubilee, 1893-1968: Transfiguration R.C. Church, Buffalo, New York. Buffalo: Church, 1968. Print. Pamiętnik Złotego Jubileuszu Parafii Przemienienia Pańskiego, 1893-1943. Buffalo, NY: Drukiem Dziennika Dla Wszystkich, 1943. Print. Transfiguration Jubilee. Buffalo: Church, 1993. Print. "Was A Great Day." Buffalo Courier [Buffalo, New York] 3 Aug. 1896: 5. Print.